I read this article and found it very interesting, thought it might be something for you. The article is called Sun News TV live: JalliKattu Bull ban protest refuses to die down and is located at http://www.panasiabiz.com/9701/sun-news-tv-live-jallikattu-bull-ban-protest-refuses-to-die-down/. Marina Beach, Chennai have been witnessing the protest of the century, as millions of Tamilians are standing there, asking to remove the ban on Jallikkattu, the iconic Tamil bullfight festival. People from various areas of life have united for this protest, irrespective of their caste, creed, economic status, and religion which clearly indicates the unity of Tamil people. As pressure mounts up from all corners, Tamil Nadu Chief Minister O Panneerselvam told that the state Government would bring up an executive order to bypass the Supreme Court decision to ban the bull-taming festival. Panneerselvam has also urged Prime Minister Narendra Modi to bring such an order. The Tamil Nadu Chief Minister added that he has already sent a draft audiences to the center, and is now awaiting it to get signed off by President Pranab Mukherjee. 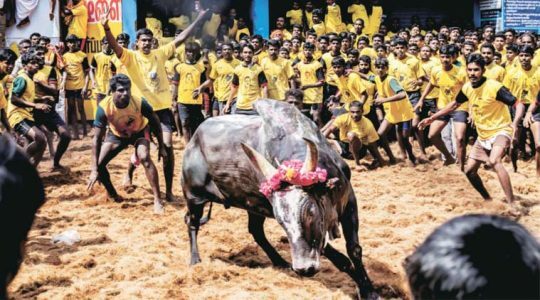 The Chief Minister has decided to extend his stay in Delhi so that he can obtain ample legal help from experts which may help to remove the Jallikkattu ban. Panneerselvam has also asked the people in Marina Beach to end their protest. On the other hand, Prime Minister Narendra Modi has taken a diplomatic stand on this issues. Yesterday, Narendra Modi told that his Government could not intervene in this issue, as the case is currently in court. Various Tamil outfits have called for a Bandh in the state on January 20, 2017. The spokespersons of Tamilar Desiya Iyakkam and Naam Tamizhar katchi also demanded the ban on PETA stating that it is a multi-billion NGO which is aiming to shatter the cultural platform of India. DMK has also extended their support to the Bandh, and as per latest updates, transport unions have told that they will also cooperate with the protest. CPI Puducherry local Committee, through a Press Release also extended their support to the current protest.